Since 2012, Georgia SHAPE has been helping schools teach kids to live happier, healthier and more active lives. Led by Governor Nathan Deal, the Georgia SHAPE initiative is dedicated to improving Georgia’s future by improving child health and wellness in a program that is rooted in research. The program is successful thanks to extensive collaborations and partnerships with organizations such as the Department of Public Health, Georgia Department of Education, the Atlanta Falcons and The Arthur M. Blank Family Foundation, to name a few. As a result, Georgia SHAPE implements and promotes empowering evidence-based programs that reduce childhood obesity and improve the health and wellness of youth across the state. We can’t manage what we don’t measure. That’s why Georgia SHAPE works with NFL Play 60 FitnessGram to assess the physical health and fitness levels of students. FitnessGram is the cornerstone of the Georgia SHAPE program, which provides a benchmark measurement of fitness for students across the state. Developed by The Cooper Institute, FitnessGram is the most widely-used youth physical fitness assessment tool and is recognized as the national assessment tool by the President’s Youth Fitness Council. In addition to providing a snapshot of youth fitness, this assessment can be used to show a strong connection between physical fitness, good nutrition, and a child’s ability to learn. 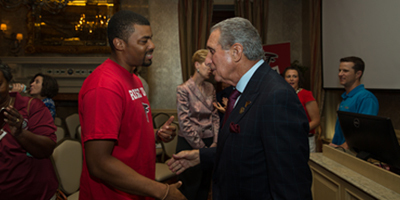 But Georgia takes it a step further, thanks to the efforts of The Arthur M. Blank Family Foundation, the Atlanta Falcons and the Atlanta Falcons Youth Foundation (AFYF). “Mr. Blank is passionate about healthy living and improving lives in Georgia,” said John Bare, Georgia SHAPE Council Co-Chair and Vice President of the Arthur M. Blank Foundation. Under the umbrella of The Arthur M. Blank Family Foundation, the AFYF has become the largest owner-funded foundation in the NFL, giving more than $20 million to nonprofits across Georgia and over $242,000 in grants to Georgia SHAPE. Embracing the NFL Play 60 FitnessGram program was a natural fit for the organization. A kickoff event was held at The Arthur M. Blank Family Office to offer training and support to teachers and administrators who would be implementing FitnessGram as an official Atlanta Falcons NFL FitnessGram Partner School. Participants also heard a special message from Dr. Kenneth H. Cooper about the long-term benefits of improving youth fitness, as well as the governor Nathan Deal, and Arthur M. Blank himself. “So many teachers were passionate about fitness and wanted this program in their schools,” said Maddy Scarnecchia, Community Relations Manager for the Atlanta Falcons. Arthur M. Blank shares his passion for childhood fitness at the Georgia NFL PLAY 60 FitnessGram kickoff event at The Arthur M. Blank Family Office. 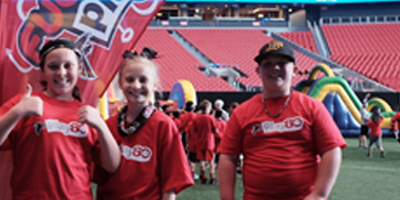 “So many teachers were passionate about fitness and wanted this program in their schools,” said Maddy Scarnecchia, Community Relations Manager for the Atlanta Falcons. FitnessGram is now in every school in Georgia, providing a comprehensive look at the physical health of students statewide. “Flag football is a great opportunity to get kids interested in the sport and improve physical fitness,” said Scarnecchia. One school from each county was selected in an application process through Georgia SHAPE and the AFYA. The interest was overwhelming. Winning schools received flag football kits with equipment and a curriculum guide to show how flag football can be used to stay active and fit. Teachers also got to work with a certified trainer to learn the exercises and make the program the best it can be. As a result, more than 30,000 children in Georgia will participate in NFL Flag Football activities, most as part of the school PE program. Since implementing these programs, statewide FitnessGram scores show that aerobic fitness levels are improving. But there is more work to be done. Expanding the flag football program is just one of many successful tactics to improve physical fitness. As the programs expand and more teachers buy-in to the impact of physical fitness on children, the entire state of Georgia has seen a reduction in childhood obesity rates and an improved quality of life for the next generation.